Richard Arlove is Ocorian’s Regional CEO for Africa, Middle East and Asia, with the responsibility for the harmonious development of Ocorian services in that region. Prior to his current position, Richard was the CEO of the ABAX Group until its acquisition by Ocorian in 2018. 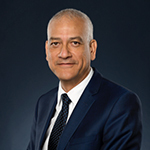 Before joining the Global Business industry in 2001, Richard spent 10 years in the accounting profession, mainly at Price Waterhouse in Mauritius and in the UK. He also spent 10 years at General Management level with Mauritius companies involved in the marketing of world-class brands. Richard is a board member of client companies and private equity funds investing in Africa and Asia. He is a regular speaker in international forums on investment and business in Africa. A Fellow Member of the Association of Chartered Certified Accountants, Richard has developed specific expertise in the areas of financial management, corporate governance, cross-border investment and trade structuring and more generally in all fields related to doing business in Africa.